Sales Of Existing Homes Dipped In September, But Prices Rose : The Two-Way While the number of homes sold was down 1.7 percent from August, the median selling price has now risen for seven straight months. That hadn't happened since 2005-2006. 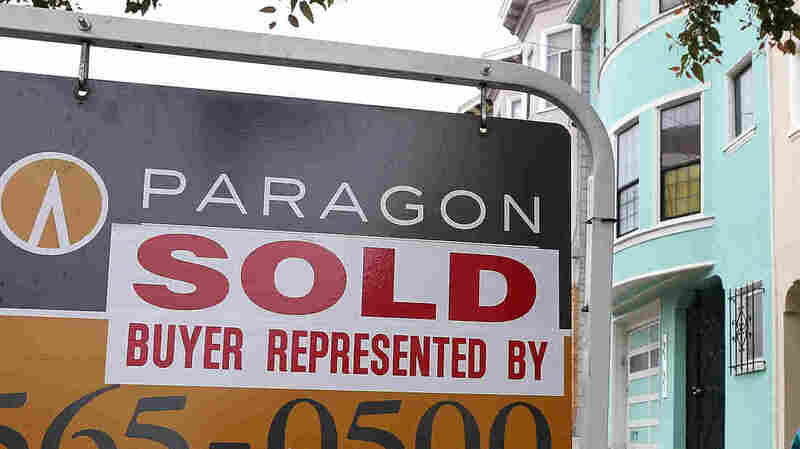 A "sold" sign in San Francisco in August. There was a 1.7 percent drop in sales of existing homes in September from August, the National Association of Realtors says. But the median selling price compared to one year earlier was up for the seventh month in a row, leading NAR chief economist Lawrence Yun to say "we're experiencing a genuine recovery." "The national median existing-home price for all housing types was $183,900 in September, up 11.3 percent from a year ago. The last time there were seven consecutive monthly year-over-year increases was from November 2005 to May 2006." One reason for the dip in sales: "The nation's inventory of homes — those for sale on the market — fell 3.3 percent during the month to 2.32 million," Reuters notes. So would-be buyers had fewer homes to choose from, which could mean that some just haven't yet found the ones they want.